The American Public Health Association (APHA) and the Institute of Transportation Engineers (ITE), in partnership with the League of American Bicyclists, have created an interactive website based on The Bicycling and Walking in the United States: 2016 Benchmarking Report. For the first time, users have access to critical data online in order to explore the intersections between transportation, health, economics, equity, government funding and advocacy efforts. 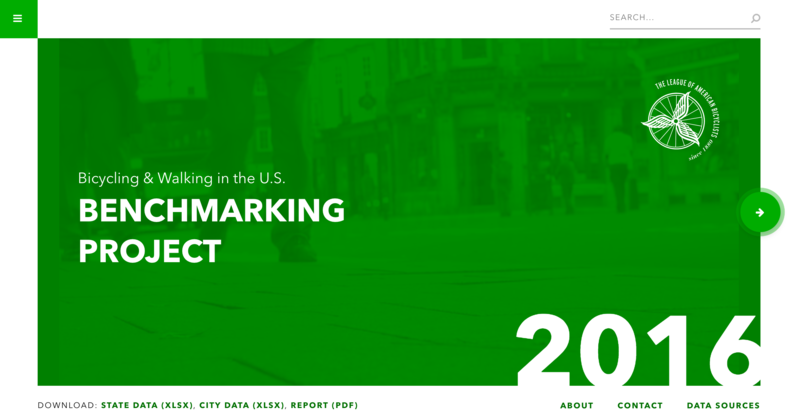 The Benchmarking Report website provides easy-to-use tools in a user-friendly manner for analyzing collected data on bicycling and walking in all 50 states, the 50 largest U.S. cities and a select number of mid-sized cities. With these toolsets, users can explore benchmarks such as mode share, public health and traffic safety. Check out the Benchmarking Report website here. Practitioners, advocates, planners and public health professionals have already tapped into the valuable report for such efforts as research, gathering facts for bicycling/pedestrian plans or reports, and supporting advocacy. A recent webinar educated viewers on how to use the new Benchmarking Report website and how to apply its information in order to advocate for bicycling and walking in communities around the nation. The website was designed and developed by Washington, DC digital strategy and design agency Taoti Creative. The website will be maintained by the League of American Bicyclists in support of its Active Transportation Leadership Institute and continued biennial Benchmarking Reports. APHA champions the health of all people and all communities. We strengthen the public health profession. We speak out for public health issues and policies backed by science. We are the only organization that combines a 140-plus year perspective, a broad-based member community and the ability to influence federal policy to improve the public’s health. Visit us at www.apha.org. The League of American Bicyclists is leading the movement to create a Bicycle Friendly America for everyone. The League advances bicycling and walking through its Active Transportation Leadership Institute, which gathers bicycling and walking groups from throughout the nation to share resources and best practices. Through biennial Benchmarking Reports we create the data needed for broad-based advocacy, policy discussions, and research. Visit us at bikeleague.org. ITE is an international membership association of transportation professionals who work to improve mobility and safety for all transportation system users and help build smart and livable communities. Through its products and services, ITE promotes professional development and career advancement for its members, supports and encourages education, identifies necessary research, develops technical resources including standards and recommended practices, develops public awareness programs, and serves as a conduit for the exchange of professional information. Founded in 1930, ITE is a community of transportation professionals including, transportation engineers, transportation planners, consultants, educators, technologists, and researchers. Through meetings, seminars, publications, and a network of more than 14,000 members working in more than 90 countries, ITE is your source for expertise, knowledge, and ideas. Learn more at www.ite.org. Taoti Creative is a Washington, D.C., based digital creative agency with 20 years' experience developing digital strategies and web sites/apps for non-profit, NGO, government and commercial clients. Taoti specializes in open-source technologies such as Drupal and WordPress, and its team of strategists, designers and developers have completed more than 500 projects to date. In addition to website development, Taoti offers digital strategy, branding & design, creative services, web production and managed hosting services. Learn more at www.taoti.com. All I see is a big blue square. I assume there's supposed to be more?